The history of skateboarding is getting rather long now, and its pioneers are beginning to move on to better sessions in the sky. Longboarding is the relative new kid on the block, and has only reached critical mass in the last couple of decades. As someone who is interested in both forms of skating, I see more parallels between them than differences. To a new skater, though, I can understand there may be some confusion. Let’s take a look at these sisters of urethane and wood, and see if we can clarify what makes each one unique. As someone who is interested in both forms of skating, I see more parallels between them than differences. To a new skater, though, I can understand there may be some confusion. Let’s take a look at these sisters of urethane and wood, and see if we can clarify what makes each one unique. Skateboarding began in the 1950s when surfers first mounted planks of wood onto steel or clay roller skate wheels. They did this because the surf was flat, but they still wanted to ride. Modern skateboarding, though, was born in the 1970s when the urethane wheel changed the game. (The 2001 documentary Dogtown and Z-Boys is a good history of this pivotal time.) Skateboarding has evolved over the ensuing decades. From the vertical halfpipe days of the 1980s to the street skating revolution of the 1990s, riders have pushed the sport into ever-newer tricks and terrains. Throughout the evolution of skateboarding, there was an underground element that stayed true to the surfing origins of the sport. Using homemade boards that were longer than the trick-oriented skateboards found is shops, these die-hards carved hills with a more soulful flow than did other skateboarders, who were busy developing their own culture. In the early 1990s, though, a group of surfers and snowboarders began reshaping snowboards and mounting them to trucks and wheels. They rode them when surfing and snowboarding were impractical. This group of friends would form a company Sector 9, and began the mass-produced longboard market that has swollen to its modern size. This video explains the beginnings of that company in the words of one of its founders. How Are The Boards Different? The modern skateboard has evolved to a point where its shape appears to non-skaters as homogenous, though subtle differences in concave, width and kick make huge differences. One thing they all have in common is being made of layers of hard rock maple. In the early days of the 1980s, there were differing shapes. Tails could be square or rounded with varying degrees of kick (uplift). The nose of the board was practically non-existent, and the boards were unidirectional. 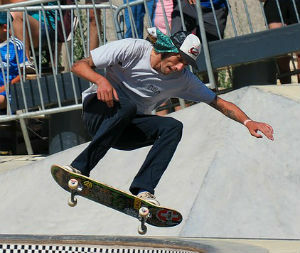 As skaters began to leave the transition (curved slopes) of pools, parks and halfpipes behind and move into the streets, the kicked nose became more prominent. Modern skateboards have kicked noses that can exceed the length of their tails. They can be ridden in either direction (regular or switch), and skateboarders draw distinctions between tricks performed either way. Their lengths’ hover around 32 inches, and widths vary from 7.5 to 9 inches, on average. The Longboard – for downhill or cruising? Longboards are usually also made of hard rock maple, though some mass-produced boards use cheaper woods or cheaply sourced maple. The shapes vary tremendously and tend to conform to the board’s intended use. 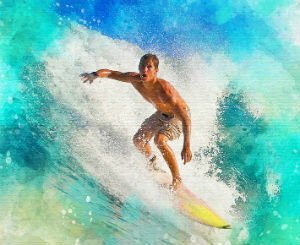 As surfboard surrogates, the first commercial Sector 9 boards had the pintail shape that is still common in cruiser-type longboards. Other shapes would follow. The term longboard has come to encompass practically any board not meant for trick skateboarding. Boards as short as 22 inches (Penny boards) and as long as 44 inches are all considered longboards. There are drop-deck boards that lower the rider’s center of gravity for better stability and drop-through boards where the truck’s baseplate passes through the deck and mounts on its top. Longboards may have kick tails and noses, but this is not ubiquitous. Pintails are still common in cruisers, and others resemble the skateboard decks from the 1980s. Skateboard Trucks vs Longboard Trucks : How They DIffer? Modern skateboards and longboards use the same technology for turning: the truck. Skateboard trucks, though, have achieved a level of perfection for purpose that has seen their features stabilize. They are mostly made from aluminum, with a steel axle. Innovation in street skateboarding truck technology is limited to inverted kingpins and various hollow parts to save weight. Ideally, hanger (the aluminum-covered axle) width is matched to board width. Longboard trucks, though also mostly aluminum, show much greater variability. Kingpins can face either inward or outward (reverse kingpin), and hanger widths vary tremendously. The Gullwing Sidewinder double-kingpin design exemplifies the room for innovation within longboard components. 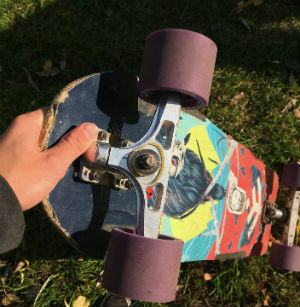 Both forms of skating, though, use urethane bushings to cushion the truck’s turning and return them to their upright position. Wheels Differ & Bearings NOT so Much! 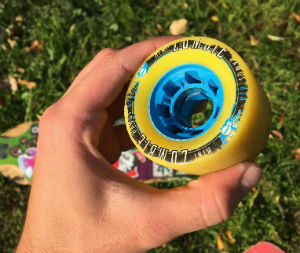 The urethane wheel that transformed skateboarding early on is still ubiquitous today, and is common across skateboarding and longboarding disciplines. The main differences between the types of wheel are in hardness and dimensions. Street skateboarders tend to prefer very hard wheels, with durometers ranging from around 98a to 101a. This hardness helps the wheel slide across obstacles when the rider is performing tricks. Wheel heights have varied across generations, and the most common heights at any given time are a matter of trend. The modern wheel tends to be around 55mm, whereas in the early 1990s wheels could be as small as 39mm. Longboard wheels are typically much softer and larger to accommodate the faster speeds the riders tend to reach. They typically have a durometer around 78a, which produces much more grip than street skateboarders usually prefer. The heights and contact patches of longboard wheels far exceeds those in street skateboards, and the ride is correspondingly smoother. Regardless of the wheel, though, the same bearings may be used across either form of skating. Street skateboarding dominates the sport today, though park and ramp terrains are still prevalent. Skateboarders seek out architecture that can be ridden, and will grind their trucks and slide their boards (or tails, or noses) across anything that allows it. Check out this video from Volcom’s “Holy Stokes” video, featuring Thrasher magazine’s 2016 Skater of the Year Kyle Walker for a prime example of modern street skateboarding. Those interested in music and dance have found expression in freestyle riding. Then, there are those who use their longboards for simple transportation and cruising on boardwalks and around towns across the globe. 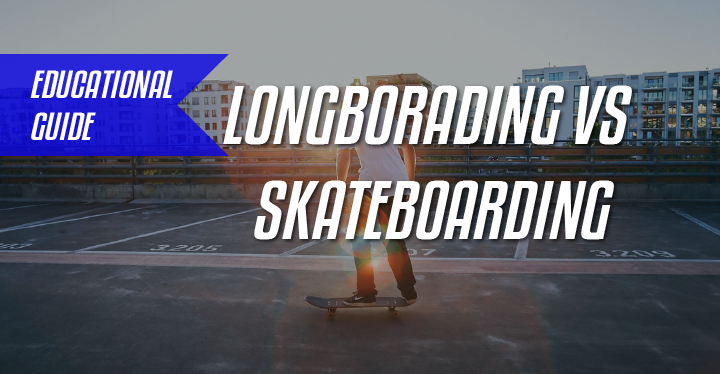 Ultimately, the differences between longboarding and skateboarding are not as glaring as they appear at first glance. Sure, the equipment looks starkly different, but it’s all really just wood, aluminum, urethane and steel. What gets us hooked when we first set foot to grip tape is a feeling that is universal in any discipline of skating. It is the freedom that comes from escaping the limitations of walking, and the pure joy in learning to translate thought into seamless action. Some skaters think that what they are doing is the “true” or “right” way to do it. This was the case in the 1980s when street and vert skaters first clashed, and it’s evident now in the chasm that exists between skateboarding and longboarding. That gap, though, exists only in our minds. In the final analysis, it’s not what you ride; it’s that you ride.